With its relatively close proximity to Ethiopia, and its shared border with Kenya, some of Tanzania’s population has had a long history and culture relationship with coffee, namely the Haya people, for whom the plant was not used so much as a beverage as a chewed fruit. Coffee (probably Robusta) was grown for this domestic purpose until German colonists essentially mandated that farmers grow Arabica coffee as a cash crop, spreading the plants’ reach within the country and developing the industry around Mount Kilimanjaro. Germany lost control of the colony to the British after the First World War, and the British attempted to develop a more efficient and profitable coffee industry along the lines of Kenya’s. Cooperatives of smallholder farmers started to organize in the 1920s to try to improve market access, but it was many years before Tanzanian coffees really caught on internationally. In 1964, after both countries achieved independence from Britain, Tanganyika and Zanzibar were combined to establish the Republic of Tanzania—hence the country’s name, Tan/Zania. Growers attempted aggressive growth in the 1970s but had difficulty increasing production. The 1990s saw efforts to reform and privatize coffee exports, allowing growers to sell more directly. 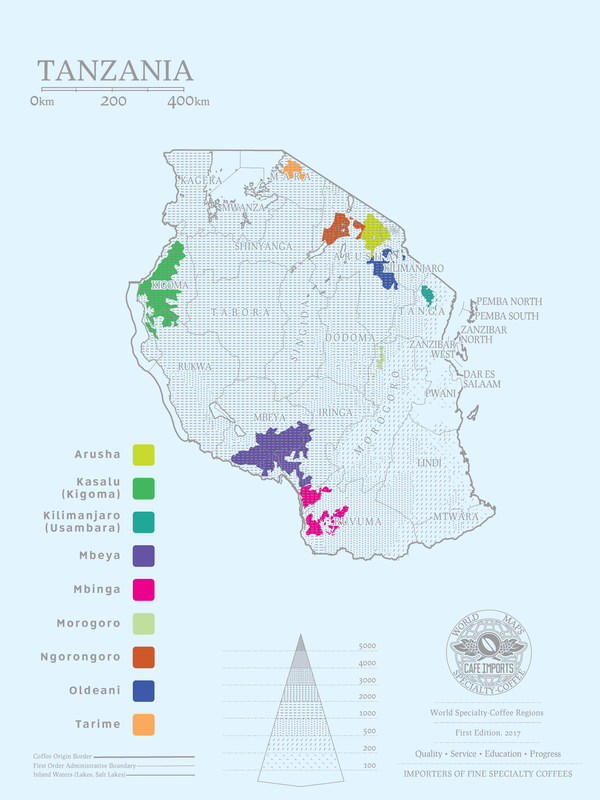 Today, in most of the Western world, Tanzanian coffees are famous primarily as separated-out peaberry lots. Peaberries are a naturally occurring mutation of the coffee seed that forms a single, small, rounder unit than the two “flat beans” that typically sit face-to-face inside a coffee cherry. While somewhere between 5–12 percent of any yield can be expected to naturally develop peaberries, some coffee varieties and origins tend to see higher occurrence of them, while in others they are uniformly sorted out of each lot in order to maintain screen-size uniformity. In the case of Tanzania, the majority of the coffee exported is bought by Japanese roasters, who prize bean-size uniformity and see peaberries as being an undesirable defect. For this reason, the peaberries are often unsold to the Japanese market, and are the majority of what is available to Western buyers. Some swear by peaberries having a degree of flavor potency that normal flat beans lack, and others can’t tell the difference. They do tend to be slightly pricer on account of both their more limited quantity (since peaberries occur in a smaller percentage of coffee overall) and the labor involved in sorting them out. For the most part, Cafe Imports has not had a terribly active sourcing strategy in Tanzania, opting instead to buy for cup quality and profile, and leaning heavily on the peaberry market to fill our offerings from this producing country. In recent years, however, we have begun exploring microlots and farm-specific lots, seeking the complex acidity and juicy texture we know the best of these coffees can have. We hope to continue leaving no rock unturned and no cup un-tasted until we discover just the right partnerships and are able to bring in the best-quality Tanzanian coffees we can find.